Click the Member Login tab in the upper right hand corner of the homepage. This will take you to the Member Login screen as seen below. Click the Request New Password button. 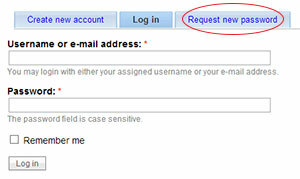 Enter username or email address associated with your account and click the "E-mail new password" button. We will email you a new password shortly.